LLMO products can be used by pouring the product directly into the waste to be treated. This method is the simplest, and is often quite effective. However, for best results, LLMO should be used with an Automatic Bacterial Injection (ABI) Delivery System. LLMO E-1 Excellent for rapid plant startup, recovery from toxic shock, help in cold weather applications. 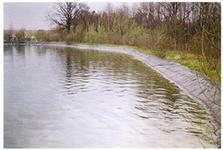 Increases overall plant efficiency, often used to improve final effluent. Effective for phenols and hydrocarbons. Use only in fresh water. LLMO E-S Salt Water Version of E-1. Proven effective in fully saturated saline environments. Commonly used in aquaculture, tannery and other saline environments, including coastal areas with infiltration. LLMO S-1 Used for sludge reduction in lakes, ponds and wastewater treatment plants. Broad based product hydrolizes a wide variety of organic solids. Must be used with ABI Systems! LLMO G-1 Used for grease and fat solubilization. Applications include sewage collection systems, wet wells, grease traps, drain lines and septic systems. Also used for various industrial waste with high grease/fat content. LLMO N-1 Suspension of nitrifying bacteria, converts ammonia to nitrite to nitrate; also denitrifies. Commonly used in lakes, ponds, aquaculture, aquariums and wastewater treatment plants. Use only in fresh water. LLMO N-S Salt Water Version of N-1. 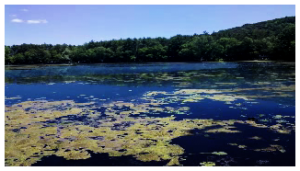 Product of choice for nitrification in brackish up to fully saturated saline solutions. Performs the denitrification step. GelPac technology involves immobilizing bacteria in a slow release gel. When a GelPac is added to water, the gel slowly dissolves, which releases GelPac bacteria to the waste stream. Whereas liquid LLMO is often added daily, GelPacs are generally replaced once per month. GelPac products (with exception of GelPac LS and LS2) must be used with an Automatic Bacterial Injection (ABI) Delivery System. This combination provides the ultimate in product effectiveness, affordability, and convenience. This combination is so unique it is patented (USPTO Patent#: 5,284,587). GelPac S Use only once per month! 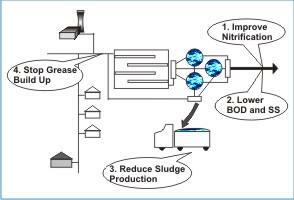 Slow release gel for sludge reduction and improved effluent performance. GelPac G Used for treatment where grease or fat is a problem. Cleans sewer collection lines, lift station and septic systems. Reduces pumping frequency in grease traps and septic systems. Results are optimized with continuous use. 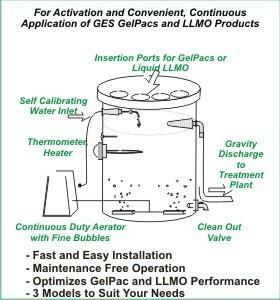 GelPac LS For grease reduction, where power or water flow not available. Great for use with tether line and flow through bag tied in place. GelPac LS2 Used for grease reduction by placing directly into influent end of grease trap. May require consultation and iterative testing for best results. ABI Delivery Systems are designed to maximize the effectiveness of LLMO and GelPac products. The ABI units are on-site bio-reactors equipped with temperature control, constant aeration, and constant rate water feed. LLMO products or GelPacs are added to the ABI units. The bacteria become fully active in the ABI, and are discharged to the wastewater continuously and automatically.Standard units are the SVD, MVD, and LVD models. The SVD is designed for use in smaller wastewater systems, while the LVD is the largest standard model. GES will custom design an ABI unit for wastewater volumes which exceed the capacity of the ABI-LVD. ABI Delivery Systems are also designed for maximum user convenience. Once the self calibrating ABI is installed, the user simply adds LLMO products once per day, or in the case of GelPacs, as infrequently as once per month. LLMO and GelPac products, used in conjunction with ABI Delivery Systems, are effective, affordable and easy to apply. These delivery systems come in (3) three sizes. 15″W x 22″H, 12 Gallons/Day Throughput, and 300 watt heater. 22″W x 35″H, 48 Gallons/Day Throughput, and 600 watt heater. 36″W x 48″H, 180 Gallons/Day Throughput, and 1,000 watt heater.